I got as low as I could get to match eye level with the lion. This image was taken when the lion was at a distance of about 13 meters (about 43 feet). The lion passed us 7 seconds later at a distance of about 3 meters. 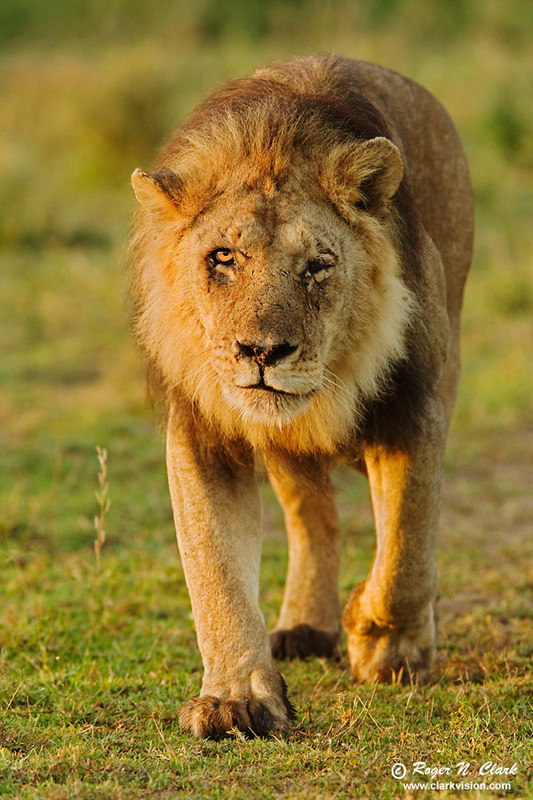 Camera data show that the lion was moving at 1.7 meters per second (3.8 miles per hour). Canon EOS-1D Mark IV camera, 300 mm L IS lens + 1.4x TC = 420 mm at f/5.6, 1/250 sec, ISO 800. Full image, no crop. AF sensor placed on eye at rule of thirds line. Autofocus in AI servo mode to track the approaching lion.